A hawk may not linger where you see it, so keep the pencil and paper handy to jot down any identifying marks of the hawk before it moves on. There are many species of hawk that make the varied regions of Michigan their home. The key to identifying them quickly and reliably involves practice and continued familiarization with their characteristic appearance (such as plumage, beak, and size differences), habitats (some species are far more likely to be seen around waterways than others) and behaviors (such as nesting, defensive, and hunting techniques). Familiarize yourself with breeds of raptor which are indigenous to the area. This will not just help you identify different species of hawks, but will also allow you to identify hawks from other types of raptor, such as vultures, eagles, and owls. Owl species typically have flattened faces and large eyes that are highly visible at a distance, whereas eagles are much larger -- sometimes double the size -- of most hawks. Learn to distinguish the flying profile of hawks from those of other raptors. 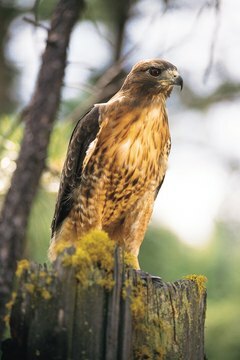 Hawks, when visible from the ground, will glide on warm air currents, and flap their wings only intermittently. Their wings are usually extended almost perpendicular to their body rather than bent (as a falcon's would be), broad when compared to their body, and the primary (fingertip) feathers are barely visible at the edges of blunted wingtips. Use your binoculars if necessary to identify the beak color and shape. Beak color and shape, more than plumage, can help you correctly identify birds. Almost every raptor has a unique beak profile, but many species -- especially juveniles -- have similar plumage. Compare the back plumage to the underside plumage. If there is a stark difference between the two, you are that much closer to identifying your hawk. Sharp-shinned and red-tail hawks are the most common hawks in Michigan with strongly varying plumage from top to bottom, while hawks that have matching underside and back plumage may be an osprey or rough-legged hawk. Take note of the environment in which you see the hawk. Ospreys and Sharp-shinned hawks are most common around waterways, as their diet consists primarily of fish. Red-tailed and rough-legged hawks are common in woodlands, farmland, and even sometimes in cities.